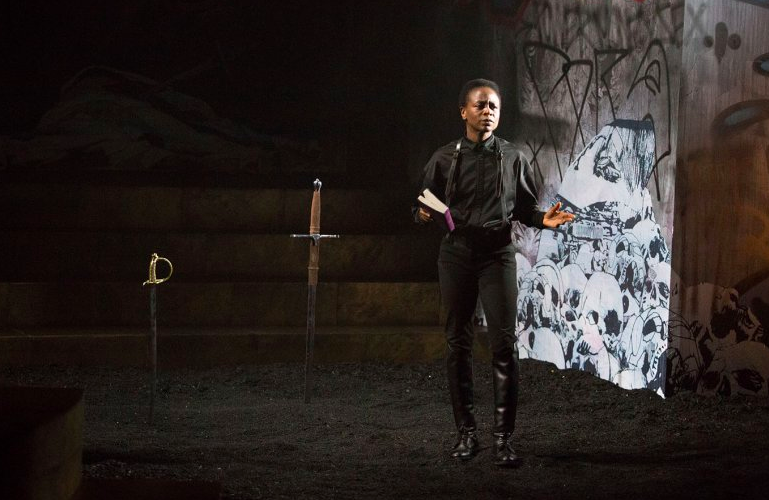 Few audiences have the chance to see a superb production of Hamlet, but even fewer have the opportunity to see a black woman play the title role in a truly breathtaking production at the Wilma Theater in Center City. And despite this fact—one which the Wilma has unashamedly promotes—the cast effectively works as an ensemble, though I wish there were more standout performances. But the best parts of this Hamlet are the detailed, thought-out design elements. Matt Saunders, a professor in Swarthmore’s Department of Theater, designed an urban set to locate Hamlet in a uniquely decaying setting. Saunders recruited street artist CERA to decorate the set with intricate graffiti and wheatpaste art that effectively creates a sense of imbalance when juxtaposed with the corrupt royalty onstage. Further adding to this dramatized social hierarchy are the show’s costumes designed by Vasilija Zivanic, a professor at Parsons in New York City. The show is set in a temporally ambiguous space, and Zivanic’s costumes reflect this uncertainty. Each character has a uniquely contemporary costume with Elizabethan flair. Gertrude, the Queen of Denmark and Hamlet’s mother, dons a beautiful cape whose inner lining changes throughout the show. Zivanic’s simple, contemporary costumes add both flair and utility to this stylized production of Hamlet as Hamlet’s simple black outfit transforms into a fencing outfit for the show’s climax. But perhaps the most surprisingly effective design element was the show’s lighting designed by Yi Zhao, a Beijing-born, Paris-raised and U.S.-educated artist currently based in Brooklyn, who makes his Wilma debut in Hamlet. Zhao’s lights are shocking yet mysterious. At times the stage is filled with bright, concentrated light as actors seem consumed by the brightness while at other times characters crawl through Saunders’ dark, mysterious set with little light, beautifully conveying the sense of unrest and unease that drive the plot forward. On the acting side, Zainab Jah, who hails from London and Sierra Leone, leads the cast with her unique take on the legendary character as she beautifully portrays Hamlet as a passionate outsider. Jah’s accent interacts uniquely with Shakespeare’s text and adds texture to the production, further cementing her outsider status throughout the show. The show’s promotional material has greatly emphasized the importance and notability of a black woman playing Hamlet—a fact that is not lost throughout the show but isn’t presented in a gimmicky fashion. Jah’s experience as a classical actress shines through as she delivers Hamlet’s famous monologues, but her embodiment of the character feels ultimately self-aware and less free than the rest of the cast. Additionally, Brian Ratcliffe ‘11 represents Swarthmore onstage as he plays the supporting roles of Laertes and the Player Queen. One other standout was Krista Apple-Hodge, a Wilma regular, as the Queen of Denmark. While I last saw her in the Wilma’s Rapture, Blister, Burn, Apple-Hodge brings modern sensibilities to this classic role. But despite these standouts, I found myself occasionally tuning out the actors to gawk at the detailed design elements. What is perhaps most exciting about seeing Hamlet at the Wilma is the fact that the entire cast (minus Jah) will be returning for Tom Stoppard’s Rosencrantz and Guildenstern are Dead that bows in May which focuses on two minor characters in Hamlet—Rosencrantz and Guildenstern—as they attempt to decipher what is happening in Denmark and embark on their own absurdist journey. Student tickets for this production are only $10 here (and selling out quickly) and the show runs through May 2nd.